Q:As health networks grow, the number of peripheral sites performing routine tests increases. With multiple lab sites tasked with running the same procedures, standardization can become a key issue. 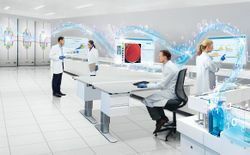 A reference lab, for instance, might send blood specimens out to several separate sites. It is crucial that all of the specimens achieve the exact same quality of separation. However, staff at one site might (in an effort to save time) incorrectly assume that spinning an EDTA tube for seven minutes at 4,000 g is equivalent to spinning for 10 minutes at 1,800 g. How can the reference lab ensure that every test site is spinning patient samples on the identical cycle? A:One of the simplest, yet most effective ways for test labs to standardize the separation of patient samples across different sites is to use set and lock centrifuges. By eliminating unnecessary complexity in settings adjustment, set and lock centrifuges leave little room for error. The operator simply pushes a button and the centrifuge runs the pre-set cycle—consisting of the exact same time and g-force as the set and lock centrifuges at sister labs— without any need for adjustments. In contrast to programmable centrifuges, which are easy for any operator to adjust, set and lock centrifuges are intentionally designed to keep their settings locked in; while the settings can be customized, it is not easy or intuitive for the end user to make changes to the program. Locking in validated cycles helps to prevent inconsistencies across lab sites. Drucker Diagnostics’ HORIZON series of “Set & Lock” centrifuges offer two different levels of simplification: a minimalist one-button, single-setting unit, or the more versatile HORIZON series with three locked pre-set cycles for chemistry, coag, and urine. By placing limits on the centrifuge’s settings, hospital labs gain assurance that patient samples at separate sites are being subject to identical, validated cycles. Ultimately, this level of standardization across labs leads to greater precision in test results and a higher quality of patient care.